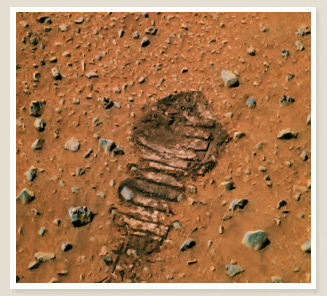 Although the Martians of our popular imagination are often fully sentient, intelligent beings, if life once existed on Mars, or exists today, most scientists believe it is in the form of microorganisms. Early astronomers began speculating about the possibility of life on Mars after observing similarities between the Red Planet and Earth. 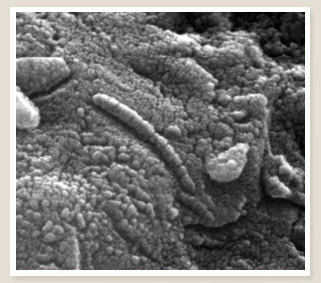 Observations made through telescopes from Earth seemed to support the popular notion that life-forms existed on Mars. But modern science challenged that idea. Images from NASA’s Mariner 5 probe in 1965 showed a desert-like surface on Mars, with no visible presence of water. Its Viking landers (1976) found no evidence to support the existence of life. As data from various subsequent missions was collected, the discovery of the harsh conditions on the surface of Mars seemed to make the existence of life highly unlikely. Yet the balance of evidence began to shift again, beginning in 1996 with a NASA study of a meteorite that appeared to contain bacteria-like lifeforms. NASA and the European Space Agency are now locked in a race to find definitive proof of life on Mars. Although NASA’s 1996 meteorite findings were controversial and subsequently discounted, it shifted the pessimistic mood of the international scientific community towards optimism. At a European Space Agency conference in 2005, 75 percent of scientists said they believed that life once existed on Mars, while 25 percent said they believe life currently exists there. In the two decades between the Viking probes and NASA’s 1996 findings, such views would have been considered extremely radical. A group of scientists in Indiana are growing small plants in Mars-like soil, in a Martian Environment Simulator, to determine whether it would be possible for astronauts exploring Mars to grow greenhouse plants on the Red Planet as a food source. Starting extremely small—with microorganisms—the scientists have shown organic Earth life can exist in near-Mars conditions. But whether or not astronauts should introduce foreign organisms into the Martian environment remains highly controversial. NASA Viking lander 1976 Mars shown to be a dry, desolate planet. No evidence of life was found. Mars Global Surveyor 1990 Evidence Mars no longer has a global magnetic field to protect against cosmic radiation. Various studies ongoing Mars has been found to have a thin atmosphere, with no liquid water. Surface conditions are extremely harsh. ALH84001 meteorite 1996 Structures that resemble the fossilized remains of bacteria-like lifeforms were discovered in the meteorite. European Space Agency’s Mars Express 2004 Proof of methane. This may indicate a life form is metabolizing carbon dioxide and hydrogen and producing methane. Various studies 2005 Data showing the presence of formaldehyde in the Martian atmosphere. This is indicative of ongoing methane production in vast quantities and supports the possibility of microbial subsurface life. Next Next post: Is there water on Mars?